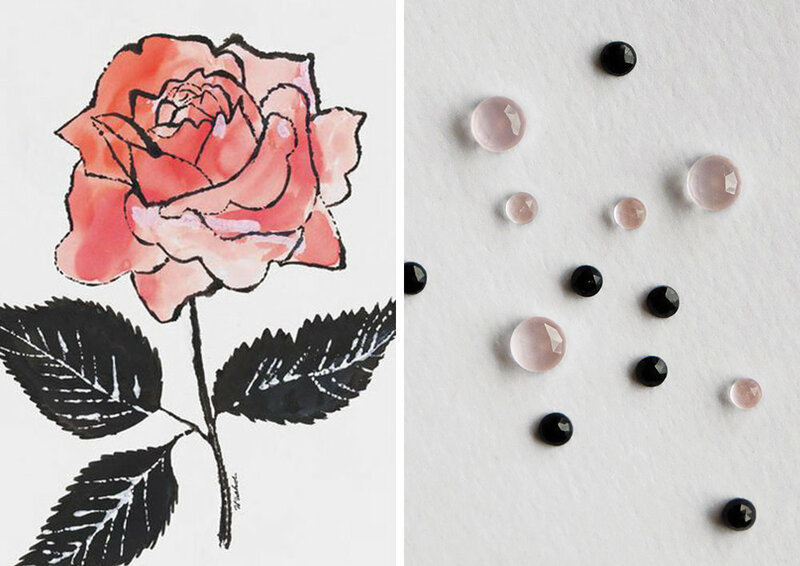 Left: Untitled Andy Warhol illustration; Right: Rose quartz and black spinel rose cut stones. One of the earliest cuts developed was the rose cut, named for the tight, spiraling petals of a rose bud before it blooms. (Once I heard that I was done for.) Triangular facets all over the top of the stone mimic petals, and each one catches the light and sparkles, even on dark or opaque stones. The rose cut is also more of an old school, antique cut; when cutting technology advanced, you could get more facets and therefore more sparkle out of stones. While newer stone cuts are beautiful, I have a soft spot for the earlier cut, especially when it’s set in a more modern design. I love using them in my own jewelry, and have big plans to use them even more in the not-too-distant future. Now that you know its romantic inspiration, have you fallen under the spell of the rose cut, too? News, musings, and things to inspire.